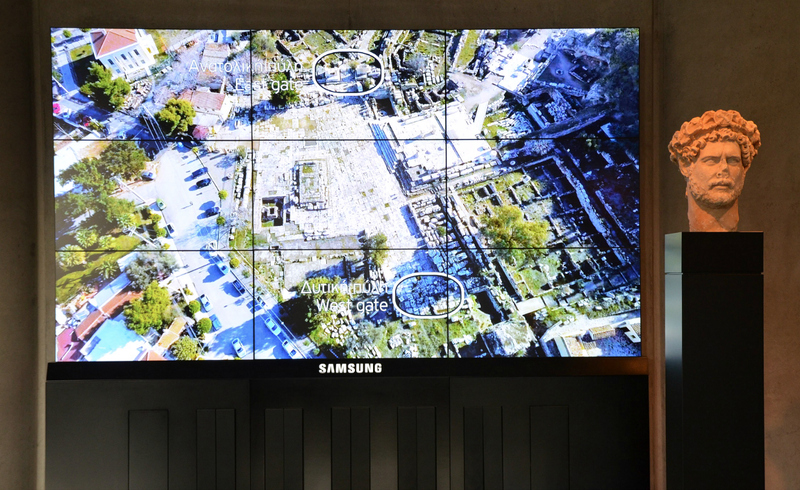 The Acropolis Museum in Athens celebrated the 1900th anniversary of Hadrian’s accession with the presentation of an exquisite portrait of the Emperor found in Syngrou Avenue and of an interesting video which showcased the Emperor’s immense building program in Athens. The presentation run from 15th January to 31st March 2017. 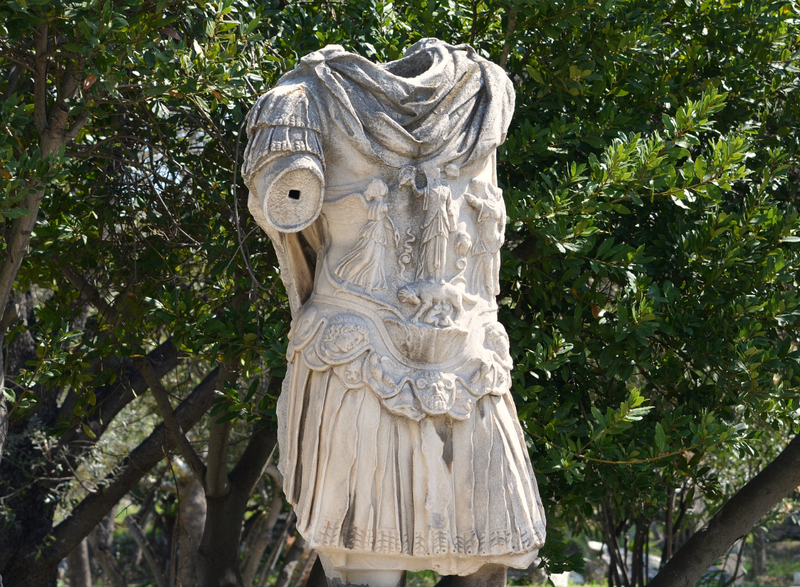 Hadrian was a dedicated philhellene who admired Greek culture. He visited Greece on several occasions during his reign (124/5, 128/9 and 131/2 AD) and was especially fond of Athens where he resided as a private citizen from 111 to 113 AD. Pausanias writes that “the Emperor Hadrian generosity to his subjects was bestowed most of all on Athens” whilst Cassius Dio tells about Hadrian’s generosity in a passage referring to his stay: “He granted the Athenians large sums of money, an annual dole of grain, and the whole of Cephallenia”. The philhellenic emperor did all he could to raise Athens to a special position in the Roman Empire and hoped to restore the city to the greatness of its distant past. 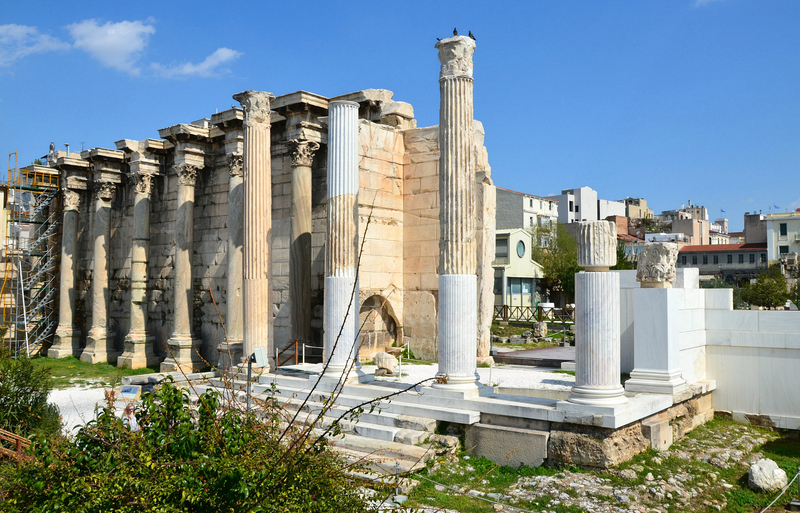 Hadrian’s affection for Athens and Greek culture in general may well have been established during his childhood education. The Historia Augusta also tells us that Hadrian’s devotion to Greek studies earned him the nickname “Graeculus” (Greekling) in his youth. Prior to becoming Emperor he was archon of Athens in 112 AD, the highest office to which a citizen could aspire. An epigraphic inscription on a statue base in the Theatre of Dionysus confirms his position. Statue base of Hadrian set in the Theatre of Dionysus on the south slope of the Acropolis, the bilingual epigraphic inscription commemorates Hadrian’s election as archon of Athens in 112/3 AD by the Athenians. The lengthy inscription provides our most important record of Hadrian’s career up to then. (IG II2 3286/CIL 3.550). The portrait of Hadrian presented at the Acropolis Museum was found in 1933 in Syngrou Avenue in Athens, on the road to Phaleron, and is kept at the National Archaeological Museum (inv. 3729). Colossal portrait head of Hadrian wearing the corona civica. Made of Pentelic marble in a Greek workshop, this portrait shows Hadrian with the corona civica (oak wreath crown) which denotes the emperor as saviour of the people. The iconography of the central disc of the crown, inlaid with the figure of an eagle, the emblem of Zeus, also identifies Hadrian as Olympios, directly linking him to the great god Zeus. His gaze is directed upwards and mirrors the slight leftward torsion of the head which was intended to be set onto a colossal statue. The nose and the central forelock are broken and there were no restorations done on this portrait. The configuration of the hair and locks associate this majestic portrait with the so-called “Imperatori 32” type, one of the seven sculptural types attributed to the extant corpus of Hadrian portraits. Approximately 160 examples of sculpted portraits of Hadrian have been found to date, and the “Imperatori 32” type was a type popular in Italy and in the provinces (most notably in Greece and in North Africa). The “Imperatori 32” type is distinct for its two rows of locks above the temples and its forehead with two parallel wrinkles. The three-dimensional rendering of the irises and pupils indicates that this portrait was made in the 130s when Hadrian dedicated the Temple of Zeus Olympios in person. 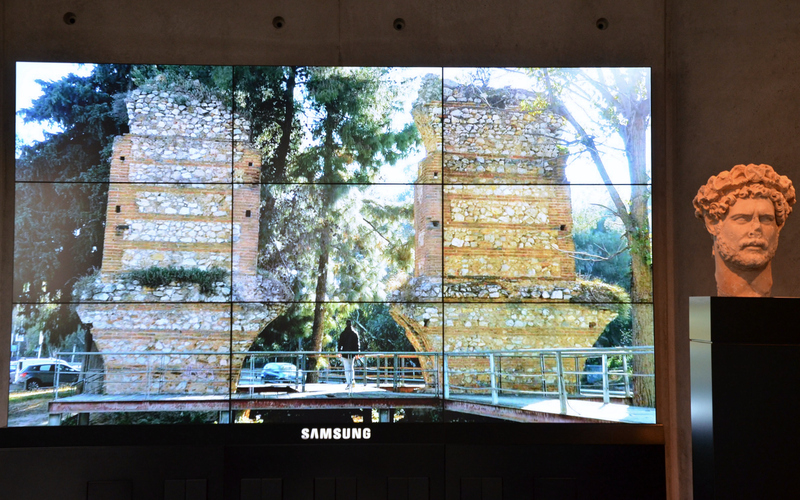 Alongside this portrait, an interesting video, produced by the Museum, showcased the numerous building projects Hadrian embarked upon during his reign. 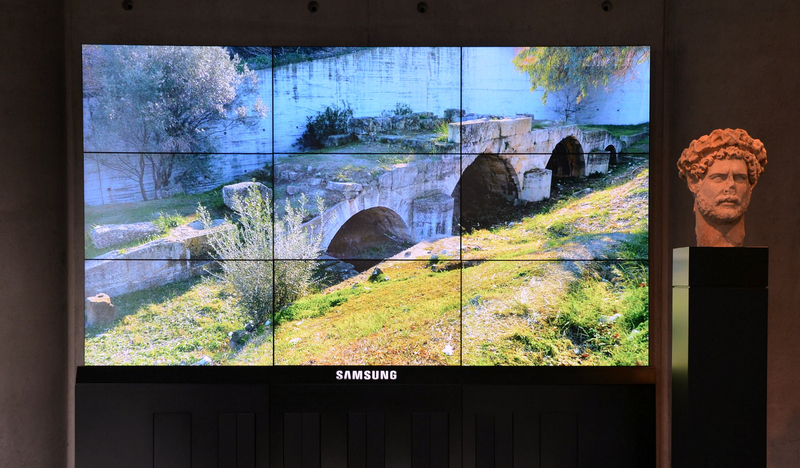 Here’s the transcript of the video’s text which presented the building program of Hadrian in Athens, accompanied by some of my photographs taken during my recent trips to Greece. 1. The year 2017 sees the 1900 year anniversary of the ascent to the throne of Hadrian, an admirer and benefactor of Athens. The Acropolis Museum pays tribute to the immense program of the Emperor who renewed and expanded the urban planning of Athens and signified the revival of Greek Letters and Science during the time of the Roman Empire. 2. Above the ancient road leading from the Acropolis to the Olympieion, a two-story gate was erected, marking the boundary between the old city of Athens (the city of Theseus) and the new city (the city of Hadrian). The Athenian Neapolis stretches under the Zappeion and the National Garden. To date archaeological excavations to the site have located luxurious mansions, baths, and a gymnasium. 3. 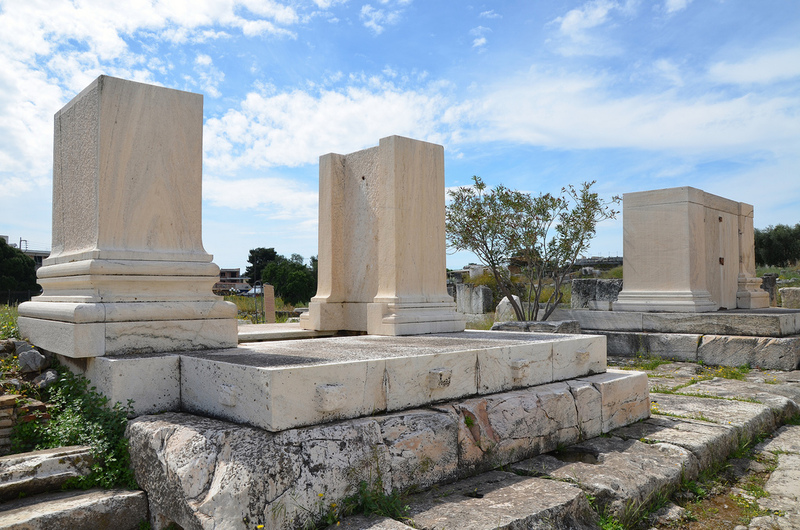 In 131/2 AD, in a magnificent ceremony, Hadrian inaugurated the temple of the god in the ancient Sanctuary of Olympian Zeus, for which construction had begun in the 6th century BC but was concluded with the generous donation of the Emperor. The gigantic temple of the Corinthian order across from the Acropolis was twice the size of the Parthenon, with a surface of approximately 5,000 sq m. Its interior housed the chryselephantine statue of Zeus. 4. The temple covered a surface of approximately 5,000 sq m and was symmetrically positioned in a rectangular enclosure with a perimeter of 673 m. Along the precinct hundreds of bronze statues of the Emperor were erected, dedicated to him by the Greek cities. Behind the west side of the temple, a colossal statue of the Emperor facing the Acropolis and visible from a great distance was dedicated by the city of Athens. The surviving corinthian columns of the Temple of Olympian Zeus. 5. In 131/2 AD Hadrian gathered the Greek cities to participate in a permanent “Conference of Panhellenes” to be based in Athens. The aim of this Pan-Hellenic program was to revive classical Greece and reinforce the prestige of the Eleusinian Mysteries. The Emperor himself was worshiped as Panhellenios. 6. A very important building constructed by Hadrian in Athens was the Pantheon where records of all the sacred buildings, the dedications, and the Emperor’s donations to the Greek but also the barbaric cities, were engraved. 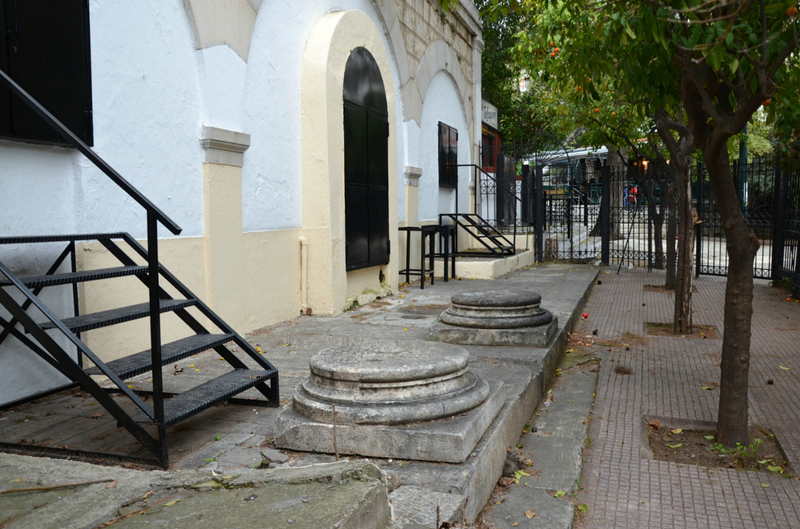 The impressive remains of a three-aisle temple on Adrianou Street in Plaka have been identified as the Pantheon. The partially restored Hadrianic Pantheon, a three-aisled basilica near the Library of Hadrian and the Roman Agora. 7. In the heart of Athens, between the Agora and the Acropolis Hadrian built, in an area of 10,000 sq m, the renowned complex of the Library that contained -in addition to the three stories housing books– reading rooms, teaching rooms, porticoes for philosophical walks, gardens and a pond for recreation. The Emperor’s goal was to create a place of academic study worthy of the reputation of Ancient Athens in Letters and Science. The Corinthian columned porch (propylon) which was built in the centre of a columned façade with seven Corinthian columns in green Karystos marble either side of the entrance doorway. 8. Hadrian tackled the issue of water supply to the new city of Athens by constructing an aqueduct 18 km in length which transported water from the springs of Parnitha to the Lycabettus. A water cistern with a capacity of 500 cubic meters and embellished with a facade of 4 Ionic columns was built there. 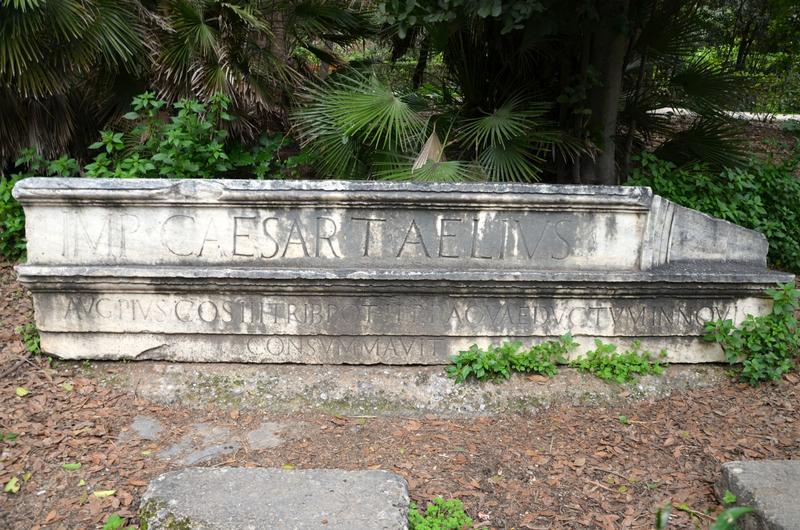 The dedicatory inscription etched on the epistyle is located today in the National Garden. Fragment of a lintel with dedicatory inscription originating from Hadrian’s reservoir on Lycabettus hill. It can be found in the National Garden. The remains of the facade of Hadrian’s reservoir located on the southeast slope of Mt. Lycabettus. It was faced by an Ionic propylon with lintel still standing in 1788. The western part of the lintel of the propylon of Hadrian’s reservoir has been placed in the National Garden (see above image). 9. Hadrian had a special regard for the Eleusinian Mysteries in which he himself was initiated on his first visit in 124 AD. In order to facilitate the course of the Sacred Procession to the Sanctuary he built a monumental bridge over the Eleusinian Kephisos River, which often flooded. The bridge was 50 m in length, 5.30 m in width and was supported by 4 arches. It is one of the few bridges still preserved from antiquity. 10. In the courtyard of the sanctuary of Eleusina two monumental gates were erected by the Panhellenes: one at the end of the road coming from the Peloponnese and the other at the end of the road coming from the port of Eleusina. Both were exact replicas of the gate of Hadrian in Athens. The inscriptions, engraved in large letters on both sides, informed visitors that the gates were erected in honor of the two goddesses of Eleusina and the Emperor, referring to the Olympian Emperor Hadrian. 11. Hadrian is the first Emperor depicted with a philosopher’s beard. His eyes are averted from life on earth and he gazes to the sky. The oak wreath crowning his head bears the emblem of Zeus, the eagle. This “political wreath” characterizes the Emperor as the savior of citizens. Great post! I visited Athens last month and found it fascinating. I just missed the exhibition about Hadrian in the Acropolis Museum, but I saw many of the other remnants of Hadrian’s time in Athens that you mention.